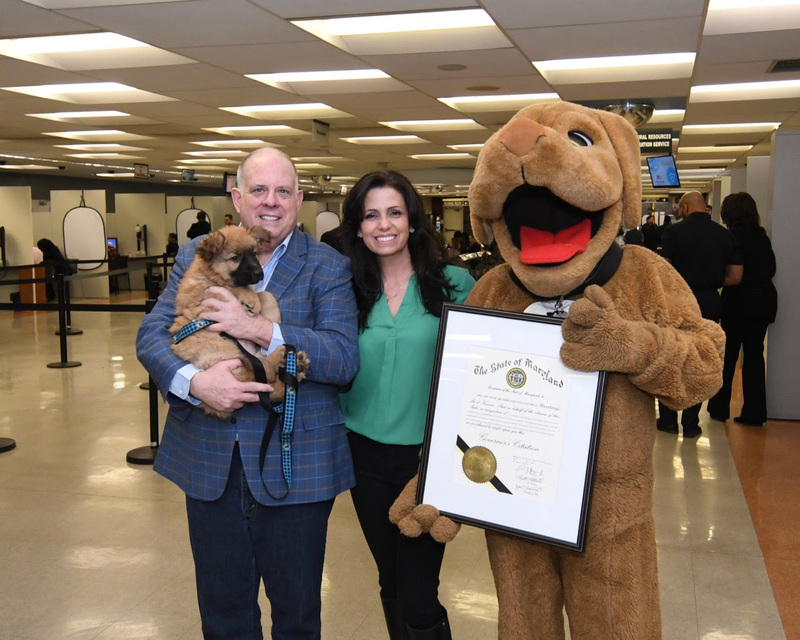 ANNAPOLIS, MD – Governor Larry Hogan today joined the SPCA of Anne Arundel County (AACSPCA) in hosting the Maryland Department of Transportation Motor Vehicle Administration’s (MDOT MVA) first ever Adopt-A-Pet Day. Governor Hogan was joined by MDOT MVA Administrator Chrissy Nizer, SPCA of Anne Arundel County President Kelly Brown, and SPCA Volunteer and Event Coordinator Lynn Gill for the event, which was held at the Annapolis branch of the MDOT MVA. The governor presented the SPCA with a Governor’s Citation and spent the morning greeting MDOT MVA customers, touring the branch, and visiting with dear furry friends. SPCA of Anne Arundel County had dogs, cats, and a rabbit for adoption at today’s event. Prospective parents were able to start the adoption process at the event. Those who are interested in adopting a pet are encouraged to visit the SPCA’s website, aacspca.org, to learn more information. The SPCA of Anne Arundel County, founded in 1920, focuses on protecting animals from inhumane treatment. Governor Hogan presented a citation to the organization for its commitment to community service and educational outreach. For additional information on MDOT MVA branches and services, visit www.mva.maryland.gov.